The Purple Pinkie Nail Salon: You don't need new sets all of the time! You don't need new sets all of the time! When you visit The Purple Pinkie and get a fabulous set of colored/glitter acrylic design nails, your full set is your initial investment of $50. It's $45 for the full set and $5 for the glitter. 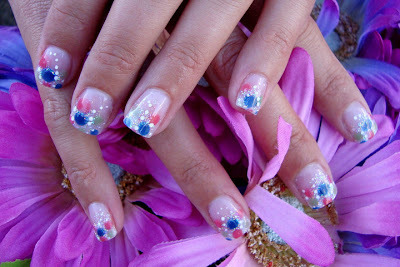 We then fill those nails for $24 or backfill to change the design for $29. We DO NOT request or require you to get a new full set like other salons. That is nothing more than a ploy to get more money out of you. Here are some examples of nails that we have done and changed the designs on. The photo above is Kylie's initial set of nails with a gumball theme. Price would be $50 for initial set. When we filled them, we just added acrylic to the regrowth area and added black accents, and Candy Drop nail art. Price would be $24 for fill and $5 for the 4 Candy Drops. This time, we went with a whole different design. This is the layered stone design that uses colored acrylic, glitter acrylic, mylar and hand painted accents as well as Candy Drop art. Price would be $29 for this backfill and $5 for 4 Candy Drops. After a few weeks, Kylie was tired of the design and wanted something simplier. We backfilled the nails and did a glitter fade with a custom black glitter mix and large irridescent glitter with hand painted hybiscus flowers. 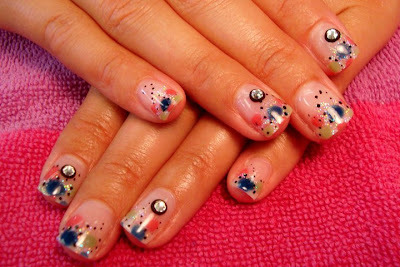 Price would be $29 for this backfill and $5 for the nail art. So, moral of this post is, take care of your intial set and it will save you money in the long run. Don't be scammed by salons that require you to do new full sets all of the time. It is NOT necessary!